This post would have been more timely in May or June, when garlic scapes were abundant in the farmers market. Garlic scapes are the flower stem of hard neck garlic and by chopping them off you help to promote growth of the bulb (or so I am told). Chopping them off also means that you can enjoy their fresh garlicky flavor. I had not heard of garlic scapes before last year. I bought some from the farmers market, wasn’t really sure what to do with them but chopped them up and used them in an omelette. Before I figured out how versatile they were, the season was over. 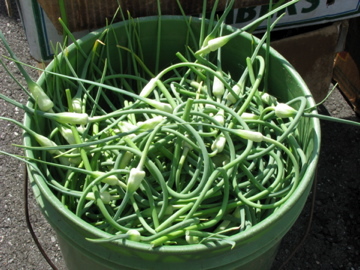 Over the course of the winter I had found a number of great recipes (Heidi Swanson’s garlic scape soup) and uses for garlic scapes and I was better prepared for scape season this spring. My favorite use for garlic scapes is pesto. I used the recipe from ‘what geek’s eat’, a wonderful blog about eating locally based in Wisconsin. Making garlic scape pesto is really simple and it freezes really well. If I am going to freeze it, I usually omit the cheese and add it later. 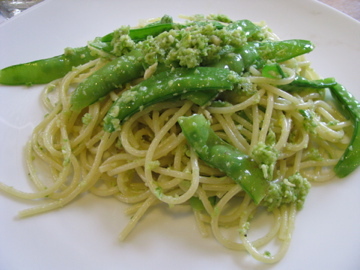 Here I used the pesto with snow peas from the farmers market and rusticella spaghetti. The bronze press pasta really does hold onto sauce better. 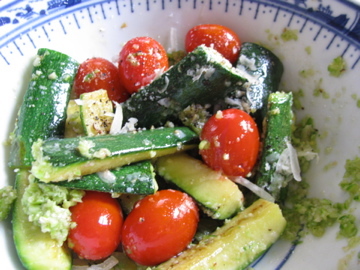 I have also used it with vegetables such as green beans, and as pictured below zucchini and tomatoes, either sauteed or grilled. 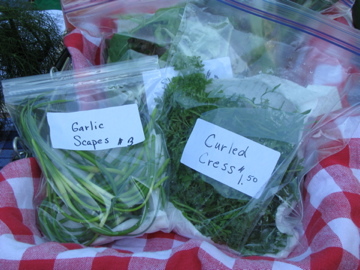 I hope you will try using garlic scapes if you see them in the market next year. You may have even had some in your garden. Here are some other ideas for using garlic scapes from the blog ‘not without salt’ (as well as some beautiful photos). I saw these at the farmer’s Market this weekend. I couldn’t get to the front to buy anything from the garlic guy, but he had bags of scapes.